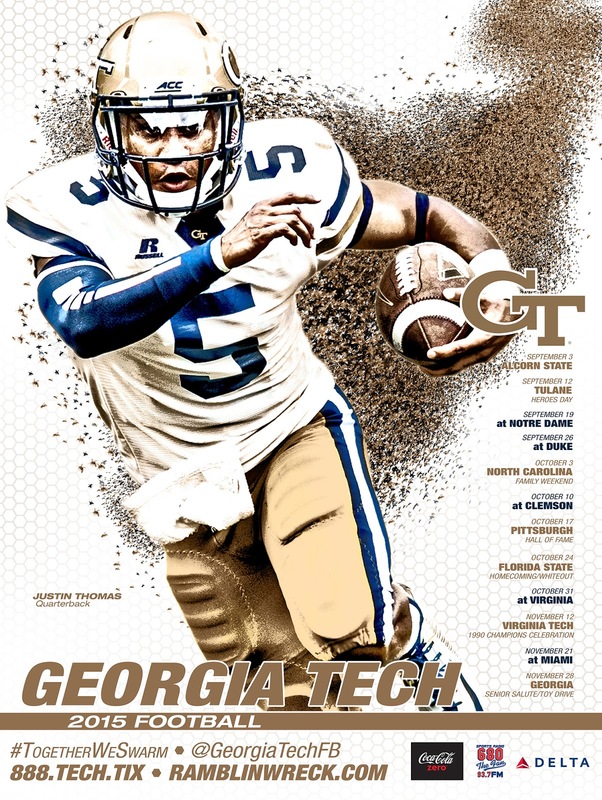 Georgia Tech rolled out posters featuring five players. 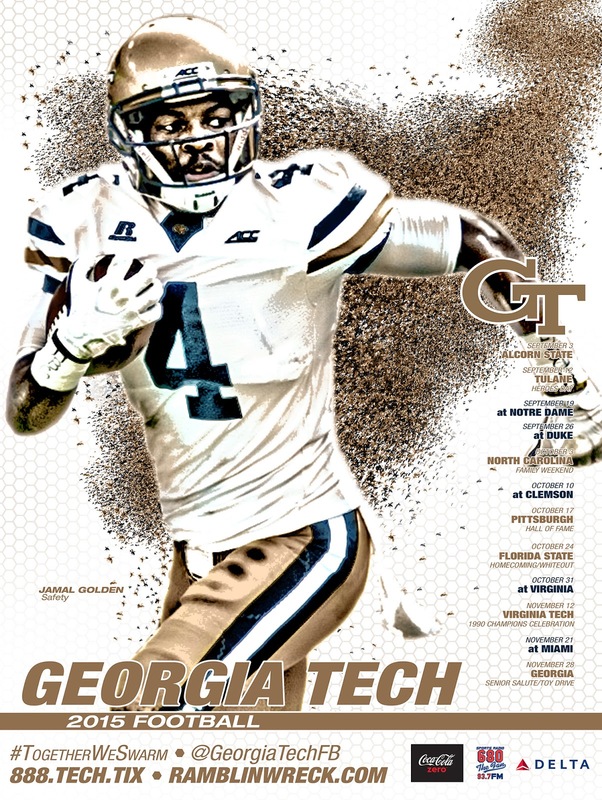 The Yellow Jackets are coming off an 11-3 season that included a 37-35 loss to Florida State in the Atlantic Coast Conference title game and a dominating 49-34 victory over Mississippi State in the Orange Bowl. Georgia Tech plays at Notre Dame on Sept. 19. Interesting tidbit about Georgia Tech dug up by Paul Myerberg of USA Today. 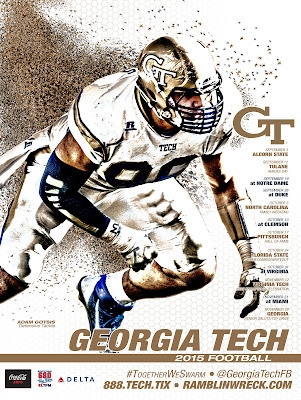 The Yellow Jackets are 4-9 under Paul Johnson in games played on days other than Saturday. 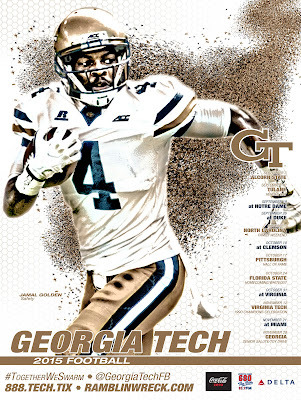 By comparison, Georgia Tech is 44-22 on Saturdays in the Johnson era. Why is this important? 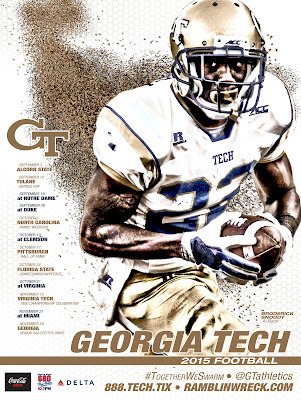 All of the Yellow Jackets games this fall are on a Saturday. 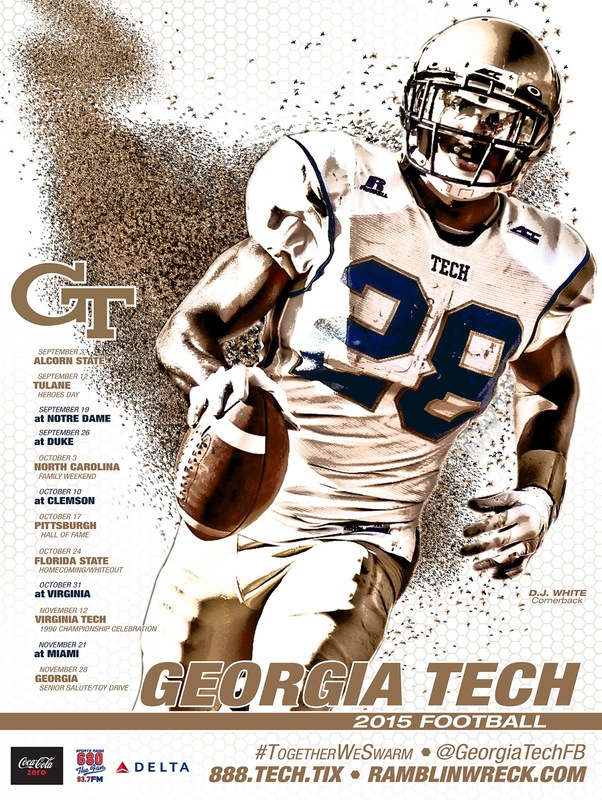 The 2012 season came unraveled for Georgia Tech after a three-game losing streak in October. 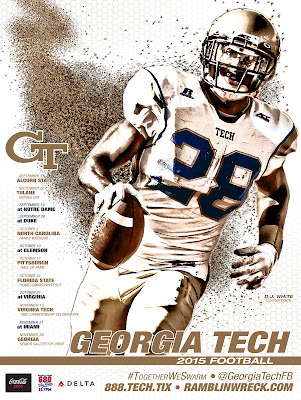 The Yellow Jackets gave up 42, 49 and 47 points in losses to Virginia, Miami and Middle Tennessee State. Coach Paul Johnson fired defensive coordinator Al Groh and the team won five of its final eight games — including a Sun Bowl victory over USC — and finished 7-7. What's the key to success in 2013. Easy. Get that defense turned around. Georgia Tech lost a toughie on opening night, falling in overtime to Virginia Tech, 20-17, in a key Atlantic Coast Conference Coastal Division game at Blacksburg. The good news is that the Yellow Jackets have seven of their final 11 games at home. Looming large are trips to Clemson (Oct. 6) and rival Georgia (Nov. 24). 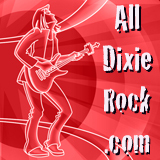 Thanks to Aaron and Doug. 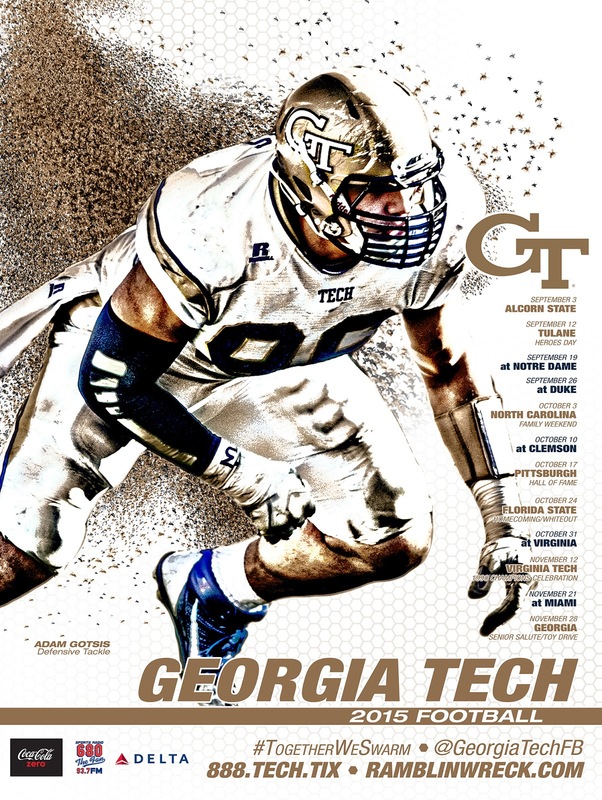 Defensive end Jason Peters and A-back Roddy Jones are featured in Georgia Tech's poster. Paul Johnson's Yellow Jackets are coming off a rough offseason. The team was put on four years of probation by the NCAA, fined $100,000 and had to vacate the 2009 Atlantic Coast Conference title for violations that also included the basketball program. Georgia Tech didn't lose any scholarships and wasn't ruled ineligible for postseason play in either sport. 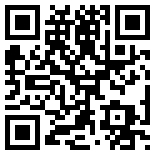 Click the image for an enlarged view. Thanks to Vu.